Hi, guys. How are you? This is my intro I guess. I like other stuff besides Lunar of course. I like anime, manga, Ball-jointed dolls, cats, and vegetarian sushi. :3 I love pickled radish rolls!! 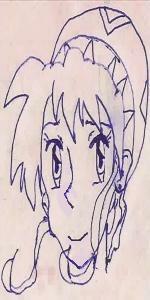 I'm also a freelance artist for manga-style art. Bienvenido! Always good to have some fresh blood around here. Mmm. Ghaleon is and always will be, AWESOME!! Welcome welcome! I hope you enjoy your time here! A true gamer plays all!